I’ve always loved order and simplicity. That sounds awfully smug, but I shouldn’t commend myself since it’s probably because my brain can’t handle very much at one time. This craving for minimalism is getting worse as I get older. Try googling the minimalist lifestyle and maybe you’ll see the attraction! Or not. 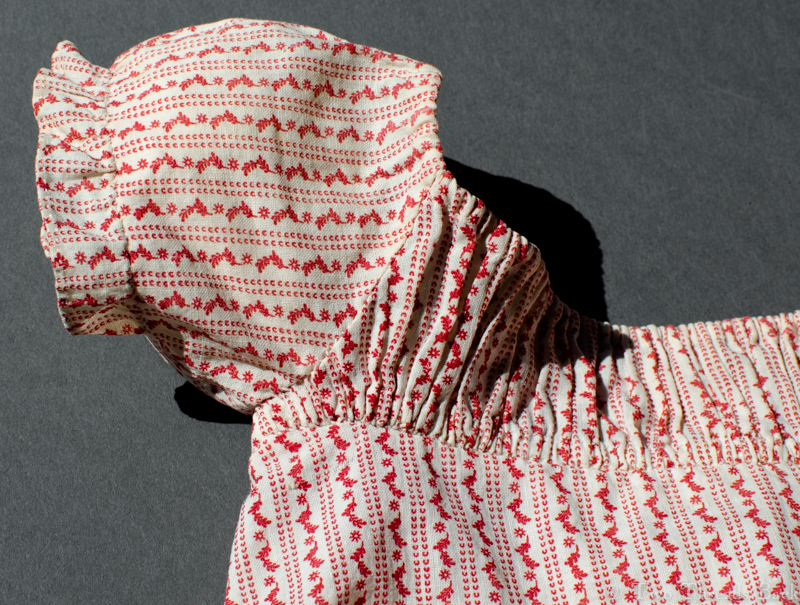 A conversation the other day started me thinking about simplicity in plain sewing. Hmm. What was the most basic stitch? Well, anyone who uses old sewing machines knows you can do just about anything with a straight stitch, which is closest to a backstitch in hand sewing. 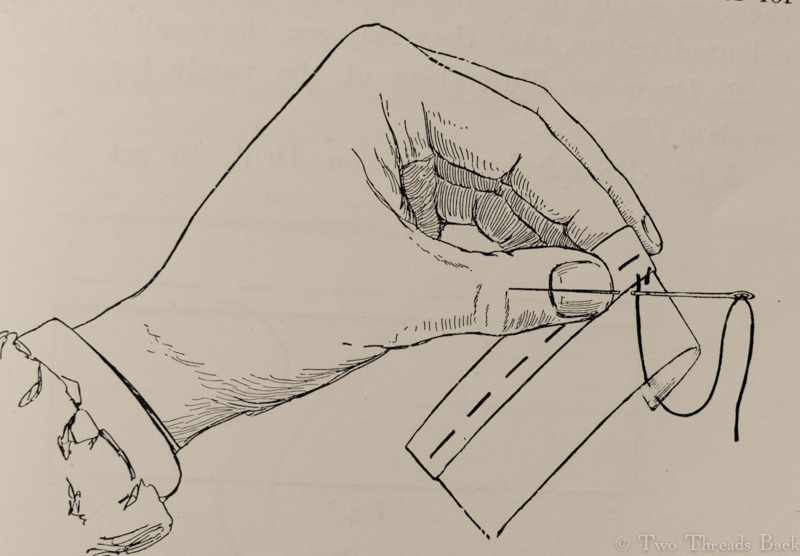 But backstitching wasn’t the primary stitch in 19th century sewing manuals, nor was running, as I learned when I studied plain needlework instruction. It was hemming. That’s the little slanted stitch that you would use to (surprise!) hem something. Once your hemming was neat enough, you could learn to work other stitches. 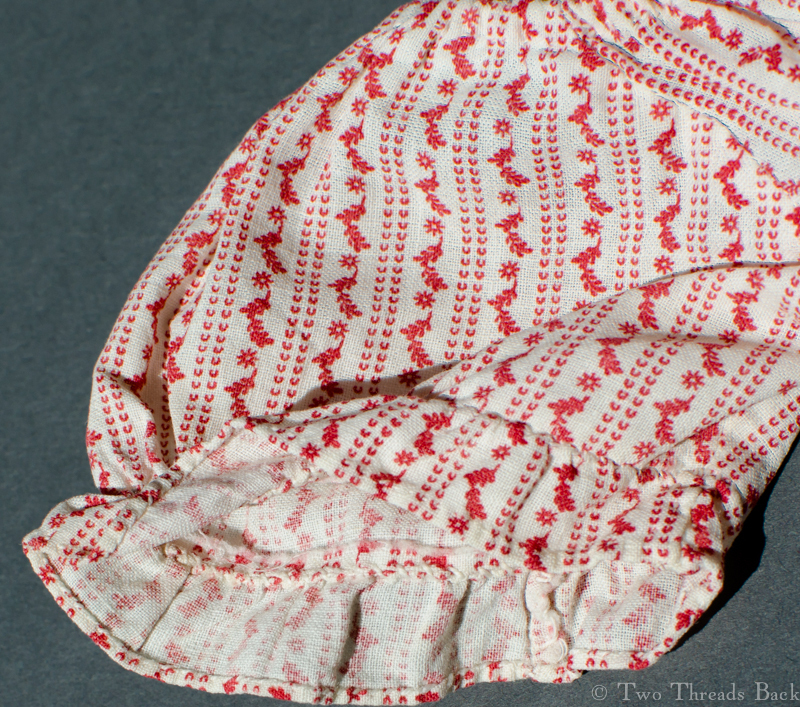 By the way, I’ve noticed that most costume historians, or at least ones I’ve heard and read, call this same stitch “whip” instead of “hem.” For example, “the edge is folded back and whip stitched in place.” But then, why shouldn’t they? I understand perfectly what they mean. If you’ve seen my post on muslin you’ll know I’ve come to terms with terms! Getting back to simplicity. I decided to go closet diving for something that used only that one stitch, hemming, to construct a garment. And I found it! 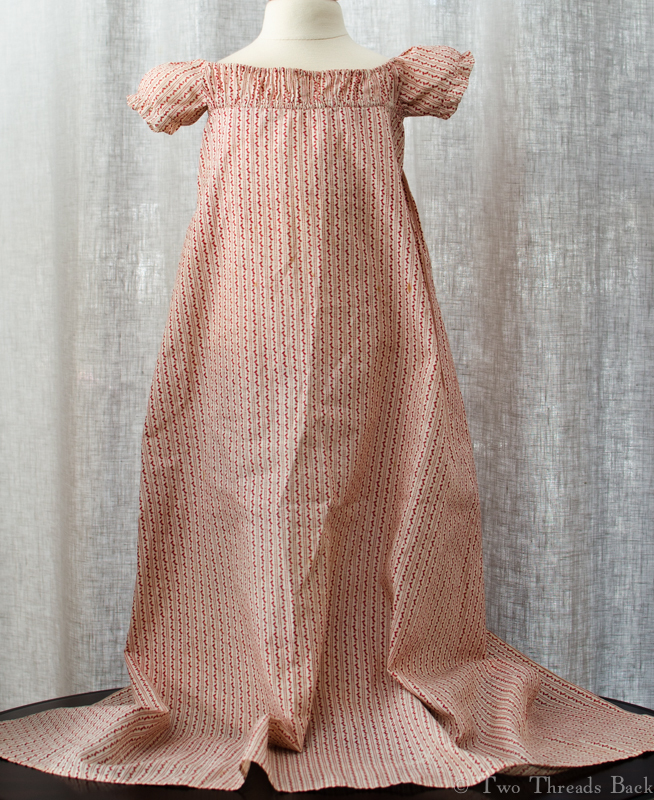 A Regency era calico baby dress. Granted, it didn’t have enough pattern pieces to warrant many stitches. But the whole gown was made by hemming! 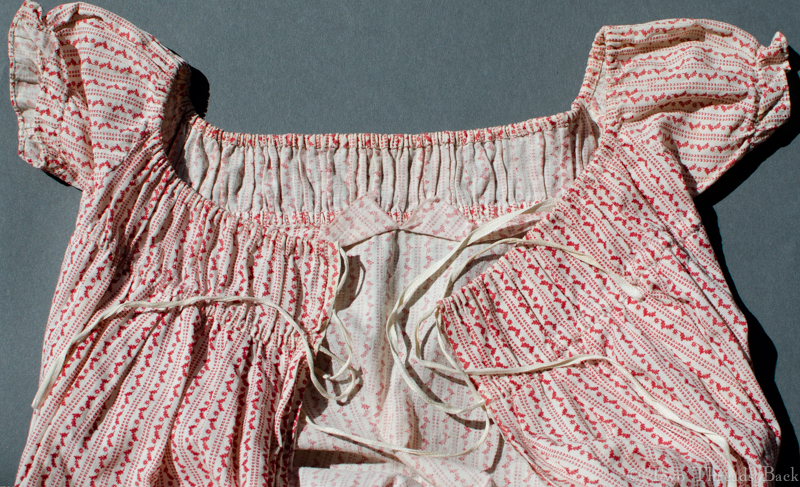 Calico Baby Gown, c 1815. Or was it? Well, in my eagerness to find what I was looking for, I didn’t look close enough, and I didn’t think it through. The skirt was made of one piece and hemmed, check. The casings for the strings were hemmed, check. The tiny ruffles on the sleeves were hemmed, check. The bodice was hemmed to the skirt – whoa! Wait a minute. That wasn’t right. Things were unraveling. I mean my clever discovery, not the little frock. Yes, the stitches looked the same at first glance, but any experience (or a practical mind) would tell you that you have to hold those two pieces face to face and sew them together. That makes it seaming, as they would have said, or overcasting, as we’d say today. 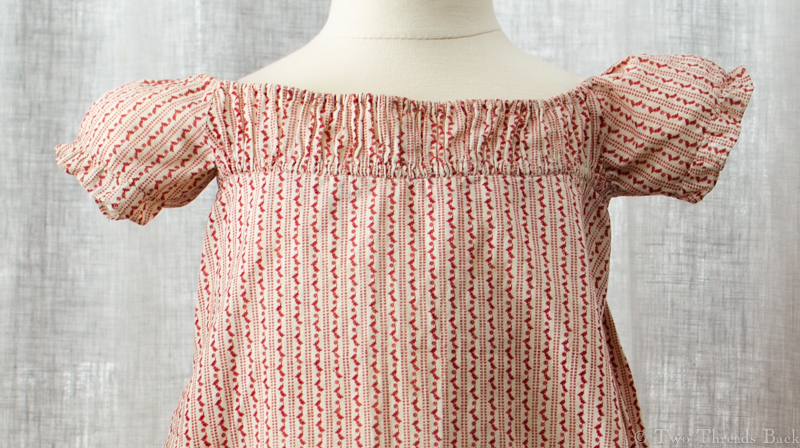 Same thing for the ruffles attached to the sleeves. And there was more. 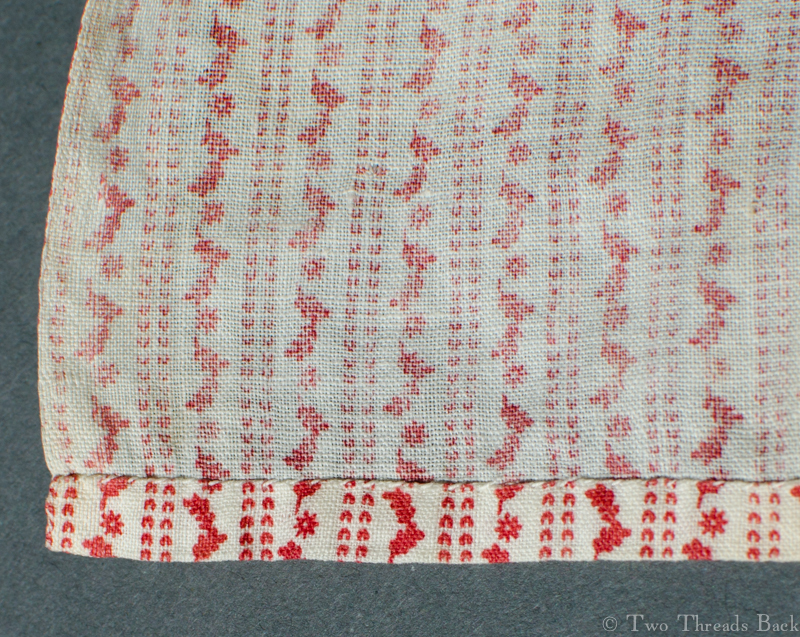 The tiny bodice sides, all three-quarter inch of them, were running stitch. As were the sleeves to the body – and then overcast! So much for that, no single stitch here. I confess it doesn’t really bother me too much that it’s not pure minimalist stitching. I’m learning to slow down and look closer. And it’s still a wonder of simplicity! This entry was posted in Antique Clothing, Children's Clothing, Hand Sewing and tagged Antique Clothing, Antique Fabric, Children's Clothing, Hand Sewing. Bookmark the permalink.